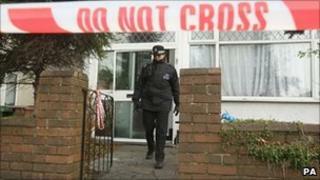 A man is being questioned on suspicion of manslaughter after a dog killed a woman in a house in south London. The victim, named locally as Barbara Williams, was mauled by a dog, thought to be a Belgian mastiff, in a property in Wallington on Thursday night. Officers found the woman grappling with the dog and shot the animal dead. The woman, in her 50s, could not be saved. The man is understood to be the dog's owner and has been named as Alex Blackburn-Smith. The Metropolitan Police said a 34-year-old man was arrested after he attended a south London police station. He was also arrested on suspicion of cultivating cannabis. Earlier police had appealed for a man, who is believed to be the main occupier of the home on Demesne Road, to come forward. Floral tributes have been laid outside the house where the woman, who was thought to be a lawyer, was killed. She has been described as a jovial and friendly member of the community. Det Ch Supt Guy Ferguson, of the Metropolitan Police, said officers were confronted by "a ferocious dog" when they arrived at the property. He said he believed the victim lodged at the house. A child aged under five was upstairs when the attack happened but was not hurt, while another female lodger was also present. The dog was "distinctly large", Det Ch Supt Ferguson said, and officers had to use shields to control it. A neighbour, Burhan Yanbolu, said he "didn't have anything to do" with those at the house because of their "big, strong dog". "There were two dogs and the big one would lean against the fence and could see over it on its hind legs," he said. The local authority for Wallington, Sutton Council, said it received a complaint about another smaller dog at the property last year. "The council and the police's Safer Neighbourhood Team were contacted in connection with the smaller dog and damage to a fence at this address in August 2009," said Councillor Colin Hall. "At that point there were no legal grounds for the council to intervene on the basis of our statutory powers. There have been no subsequent complaints." Police said they would investigate whether they had received such a complaint. They have also removed a younger dog from the home, which is being examined by forensics officers.